Are you on the hunt for an alternative to curtains? Love pattern but would like something more neutral and sleek for the windows? Then read on. I have a good friend in London who has been busy with home improvement projects and decor upgrades to her Edwardian terraced house. A beautiful home with lots of space, natural light and original features, it's a townie's dream pad. After some months having not visited this good friend (friendship goals - visit more!!) I was excited to pop down a few weeks ago to catch up and have a nosy around her new and improved home. There were all the things I was expecting from this design conscious family; light wooden floors, gorgeous wallpapers, stylish furniture etc etc but the one thing I was a little surprised to see was that SHUTTERS had been installed in almost every single room. The living room which I had expected to be adorned in beautiful thick lined drapes were also clad in these neat looking white shutters. I sort of had it in my head that shutters would block out much of the light and make the space feel a bit hemmed in (my two worst nightmares), but I was totally wrong. The light was still streaming through the house as it had done before and the shutters looked aesthetically absolutely gorgeous. An abundance of pattern in the form of cushions, throws and accessories popped beautifully against the clean white shutter backdrop. The installation cost a few thousand pounds of their hard earned cash but they were so pleased with the look and practicality it was a no-brainer option. This was officially where my love for shutters as a curtain alternative began and I wanted to share a few of my thoughts on the many bonuses of ditching the heavy drapes for the shutter variety. So my above thinking that shutters would block out light was obviously deluded; the great thing about shutters is that you can control the amount of light coming through by shutting some or all of the slats or opening them entirely like in these kitchen windows above - this is particularly handy if you have say a really overly bright sunny room which is in need of some toning down every now and then. OK so they look fantastic style wise, there's no denying that. Shutters also work equally well in a traditional or contemporary setting; I've seen some utterly divine examples of shutters used in super open and modern interiors. I think opting for a white wood makes sense for the long-term and personally I think this looks the most stylish; the light bounces off the it beautifully and it's a classy colour that won't date or fade over time. If it's a pop of colour you're after though then there are paint matching options; the possibilities are endless! A feature for city dwellers in particular are that shutters serve as a great way to create that barrier between your home and the often nearby street or pavement. The obvious privacy you gain from shutters is a bonus too in rooms like the bathroom and bedrooms and say a kitchen on a ground floor flat; I've seen shutters used in lots of flats in London along our road and they look so lovely from the outside too. Here is a shot from our neighbours opposite. Do you have a particularly tricky or awkward shaped window? 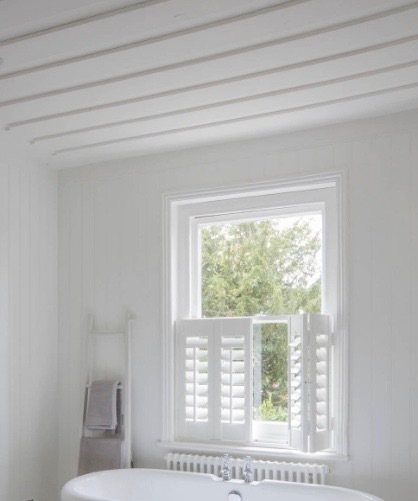 Shutters are a great fit for virtually any shaped window and can be customised to fit non-standard windows. There is a fantastic company called Luxaflex who can create and craft beautiful shutters and blinds, check them out here. How beautiful is this half moon window below. The shutters make a real feature of the shape and style. This is an area I am useless at - energy saving!! Sam is constantly telling me to close the doors to keep the heat in and annoyingly put more layers on in the dead of winter BUT the fact is I fail miserably in my attempts to be more energy conscious (second goal - think more about the planet!). Another reason why shutters are fab; when fully closed the timber barrier will act as a heat retainer and that all important noise barrier to the outside world. Ah-ha, now therein lies what could be the one and only little blip in my shutter love story and what you might be thinking....the cost? But trust me when I say shutters are a brilliant investment. Not only do my best budget busting friends tell me so but a bit of past experience points to this too. When my parents bought that gorgeous rental flat in London a few years ago (the one mentioned above!) my dad decided to rip out the existing shutters and put curtains in (why oh why). Needless to say three years on and we are now putting new shutters in before the flat goes on sale again because the curtains take up too much space and look so drab and heavy; a lesson learnt - the shutters helped seal the deal on buying the flat and we are sure they will add value to the space this time round. Hindsight is a great thing and the only issue I have now is how I can erase the new shutters from the fixtures and fittings list and take them with us! So what you do you think of shutters? Would you invest in installing this alternative to curtains? What feature would work best for you and your home? As always I would love to hear from you so leave me your comments below. This blog post is in collaboration with Luxaflex. All opinions are my own and I never recommend or advertise products I wouldn't buy or use myself.